Like many who picked up Monster Hunter: World last Friday, I’m a virgin to the series. Please don’t take that quote out of context. Not including some brief encounters with the game during EGX and other events, or a demo of the original game from an old issue of Official PlayStation Magazine, I’ve never owned nor sat down with Monster Hunter game for a significant amount of time. The hunters in Monster Hunter: World start the game on a ship, sailing to “The New World”, full of mystery, wonder, monsters to hunt and loot to be had. Those hunters are like myself and a lot of people who purchased the game: they’re going in blind. They, like me, know little to nothing of what is in store for them in this strange land. After more than 25 hours navigating this New World, my journey is nowhere near complete, and I love it all the same. 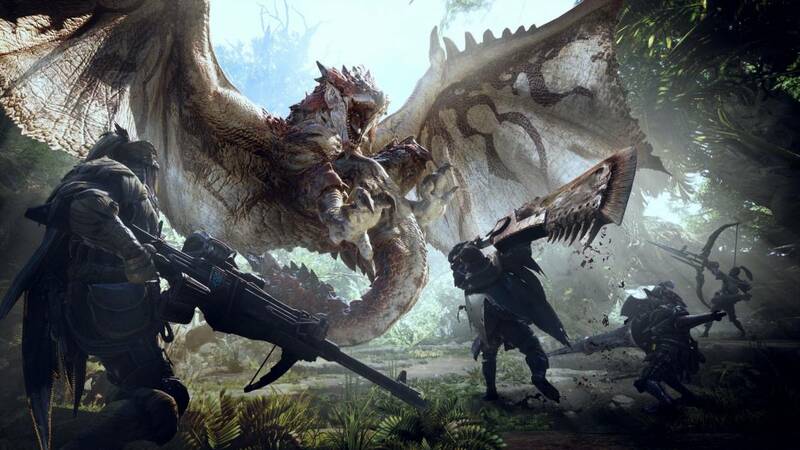 Veterans of the series will tell you that Monster Hunter is a complex game filled with content, whether that be items to collect, weapons to create and, obviously, monsters to hunt. The amount of armour and weapons you can make, which all come equipped with unique stats and skills, is astronomical. Completionists will have a lot to cover here. Players can pick from 1 of 14 weapon classes right from the outset, which includes your typical Great Swords, Lances, Bows and other ranged weaponry, but there are some classes that are more inventive. The Switch Axe allows you to swap from a sword to an axe on the fly, which changes the speed of your moves and your overall damage output. Meanwhile, the Hunting Horn is a giant blunt weapon that allows you to create melodies as you attack, which buff yourself and your fellow hunters. The joy of Monster Hunter, especially in the early going, is finding out which weapon type works for you. With 14 different types, there’s bound to be one right for you. Personally, I’m favouring the Great Sword, as it’s a simple moveset with a high damage output, though its attack speed could be described as glacial at best. However, you might prefer something like the Twin Blades, which sacrifices raw damage for sheer attack speed. Not only do you have those 14 weapon types, within each type are at least a dozen different trees that allow you to create weapons with different levels of damage output, elemental damage and skills. Though the movesets remain the same, their usefulness is directly related to the monster you’re currently hunting. If the monster breathes fire, maybe don’t use a weapon that’s imbued with fire. Ultimately, it’s all about experimentation. That same premise is applied to plenty of the monsters that you encounter. Though there are tutorials that inform you about the core concepts of the game, there’s so many hidden functions at play that the only way to truly learn how to play the game is by doing it. If the Barroth is covered in mud, is it still weak to fire? No, it becomes weak to water instead. Can I tranquilise and capture a Rathalos whilst it’s sleeping? Yes, along with almost every other monster in the game. How will an Anjanath react to a trap I’ve just placed? You’ll probably piss it off, but feel free to try regardless. The actual meat of the gameplay can feel slow, though that’s somewhat realistic when the majority of the weapons in the game are twice the size of the player character. Unlike character action games or hack and slash types, you are completely in control of where and how you swing. There’s no auto-tracking or corrections if you miss. It takes a lot of getting used to when you’ve spent the best part of a decade relying on lock-ons, but here the general lack of it both makes sense and is effective. Firstly, you need more control over where you swing because loot is dictated by where on the monster you smashed the hardest. You want fangs? Knock its teeth in; it’s as simple as that. Secondly, giving you more manual control makes the strategies you create and execute more fulfilling when they succeed. Jumping off a cliff and driving a 6ft sword into the skull of a rampaging Diablos makes you feel like the all conquering Monster Hunter you’re supposed to be, even if the Diablos shrugs it off because it’s a goddamn Diablos. There are several mission types in Monster Hunter: World. Assigned quests function as your main story quests, taking you to the different areas to hunt progressively harder creatures. Optional quests offer a wider range of objectives, such as hunting lots of smaller creatures or obtaining certain items. Yes, there are egg hunts. Investigations are the randomly generated challenges of the game, which often take the form of multi-monster hunts. Though the risk is higher, so is the reward. Progression is made via what’s been referred to as one of the most enjoyable “loops” in video gaming. You hunt a monster, grab its loot, craft better weapons to fight bigger monsters to earn better loot, and so the loop continues until you’re wandering around the main hub Astera like a demi-god amongst mortals. On face value, it sounds like a grind, but it’s less RNG influenced than most. We’re looking at you, Destiny. As mentioned, if you want a specific item, you just need to focus on that part of the monster. You’re completely in control of how you wish to improve your character, which is a liberating feeling. Most grind based games fall down due to their very nature. Excitement turns to tedium as you repeat the same quests ad nauseum. Thankfully, one of the main plus points for Monster Hunter: World is just how open-ended hunts can become. Your quarry might encounter a monster that’s higher or lower on the food chain to it, causing a turf war to occur. Alternatively, the monster may attempt to retreat to its lair to recuperate, affording you the perfect opportunity to set a trap and try to capture the thing. It might sound like a cliche to say that each hunt is different each time you play, but that’s often the case. That statement is especially true once you introduce 4 player co-op into the mix. The monster gets tougher, but the level of unpredictability and the chance for new strategies increases exponentially. Besides, there’s something to be said about teaming up with some of your best mates to hunt down a common enemy. It’s simplistic in its idea, yet incredibly satisfying in its result. It’s safe to say I’ve fallen in love with Monster Hunter: World, but by its very nature, Monster Hunter isn’t for everyone. Fights with monsters can take upwards of 10-20 minutes, turning into long protracted brawls across the entire map, which feels epic if you love the game. If you don’t, you’ll probably wish that the monster would just hurry up and die. Plus, the speed of the majority of your attacks does take a lot of getting used to, and some players simply won’t be able to make the adjustment. It’s a marmite game: people either love it or hate it. Yes, that’s a decidedly British reference, so feel free to insert your own culturally relevant substitute. Whether you become enamoured with Monster Hunter: World or despise its very existence, you owe it to yourself to try. If you take to the game, and allow yourself to immersed in it, MH: World is one of the most expansive, rewarding and gratifying RPGs to come out in recent years. Monster Hunter: World isn’t for everyone. The focus on loot and grinding ensures that, but everything it does is superlative, making it an essential purchase for any RPG fans looking for something new. As for the established fans, it’s everything you loved about the old games, but prettier. A win/win, all round.Microtransactions: None, unless you count cosmetic DLC. There are no premium currencies though.